There’s not a Golden Knight fan in the world who hasn’t wondered what the future holds for William Karlsson. The 25-year-old is a restricted free agent at year’s end which means George McPhee has plenty of options. Kevin Horton dives into the numbers in our newest Guest Post. Best part of a hockey game? Easy… the goals. Unfortunately, like most great things in life, they don’t come cheap. Per CapFriendly, at this point of the 2017-2018 season the going rate for an NHL goal is $318,437. That prorates the number of goals over an 82 game season. Basically, every time someone buries one in the back of the net it’s more valuable than the house you live in. 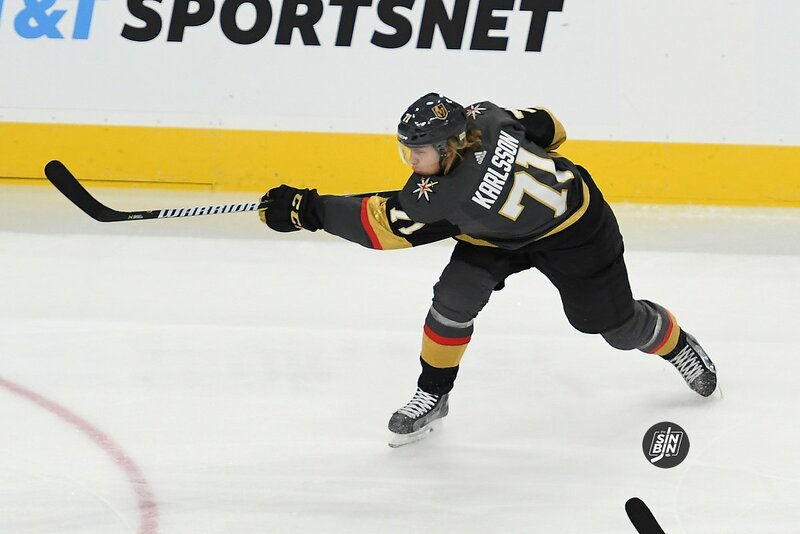 The good news for us is that the Golden Knights employ William Karlsson who is about as cheap as an elite goal scorer comes. Karlsson entered the season on the final year of a 2-year $1,000,000 per year deal. That means Karlsson’s 39 goals so far have come at a rate of $25,641 per goal, good for the 3rd cheapest scoring price in the league behind only young stars like Winnipeg’s Patrik Laine ($21,512) best player in the world-Connor McDavid ($23,718) and Brayden Point of the Tampa Bay Lightning ($25,432.) If you standardize the individual numbers Karlsson projects to finish with a $23,345 cost per goal trailing only Laine, Point, McDavid and Auston Matthews ($21,352). For comparison goals from higher paid perineal snipers like Alex Ovechkin, John Tavares, and Nikita Kucherov cost $198,277, $152,439, and $114,689 respectively. Karlsson’s goals are basically coming at over a 90% discount compared to league average and a 75% discount compared to the league’s other top goal scorers. That’s quite a bargain. Now the bad news, a Karlsson goal is about to get much more expensive. With his deal up at the end of the season, the Golden Knights should be looking to lock Karlsson up long-term to ensure the elite combination of Marchessault-Karlsson-Smith remains in Vegas throughout their primes. But what does a potential extension look like for William Karlsson? With Smith inked through the 21-22 season and Marchessault having two extra years on top of that, a 4-6 year deal would work great for Vegas and should fit decently with Karlsson’s desires as well since it would theoretically allow him to go out and get one more big money deal before getting too far past 30. But exactly how much is Karlsson’s next contract going to be worth. Matthew Henriques does a good job of digging into the details here. Basically, given his age and underlying numbers, Karlsson projects to garner about $4-4.5 M per year for 5 years. With over $27 million of cap space in 2018/2019, the Golden Knights should have no problem signing Karlsson to a long-term deal and locking up the best line in hockey for right around $15 million a year for the foreseeable future. In comparison, Connor McDavid will have a $12.5 million dollar cap hit next year on his own! Kopitar and Toews each have a cap hit of $10 million or more. Vegas should be thrilled at the opportunity to solidify their top line at this price. Of course, Karlsson is only an RFA so there is still a chance that he returns on a short-term deal for somewhere between $1-2 million and waits until he can truly hit free agency in two years. And yes his sky-high shooting percentage may be screaming regression but I still think it is in Vegas’ best interest to lock him up long-term as soon as possible. Karlsson is a legitimate top 10 Selke candidate and could easily drop another 30 goals next season even with a dramatic shooting % decrease. Marchessault and Smith provide great value at $5M a year, however, if the Knights play their cards right William Karlsson could be the best value on the on the best line in hockey when all said and done. You can follow Kevin on Twitter @khortonlv16. 2 year $10 million, $5M AAV, it’s the best prove it bridge contract for both sides.